I complained at length about keyboard shortcut inconsistencies in Mac OS X the other day — an OS that’s supposedly ultra-consistent — but it appears that the Apple isn’t wholly to blame. I singled out Firefox and NeoOffice as particular offenders (largely because as a new-ish Mac user, they’re the two apps I use the most), but I have now found an explanation for Firefox’s keyboard shortcut misbehaviour. 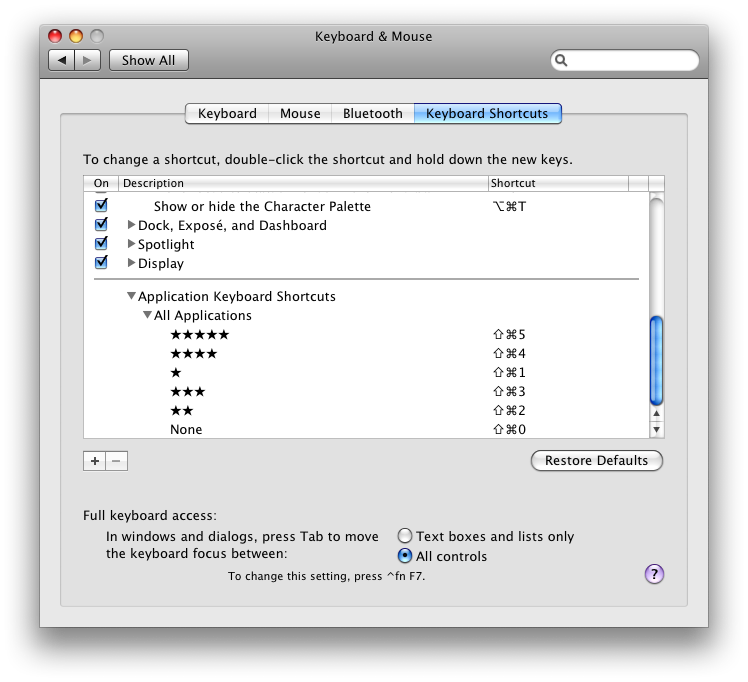 There is an option to override an application’s keyboard shortcuts in Mac OS, via System Preferences > Keyboard & Mouse > Keyboard Shortcuts. I haven’t delved too deeply into this tool yet, but it appears to offer a way to trigger menu commands in an application with a custom keyboard shortcut. I say ‘appears’ because I have briefly tried to create keyboard shortcuts for rating the song currently being played in iTunes, but despite using the ‘All Application’s option rather than just ‘iTunes’, the shortcuts only work when iTunes is the focused application. But, I digress. Anyway, it seems that while you can override Firefox’s keyboard shortcuts in a similar way, the keyboard shortcuts don’t work at all, and this has been reported as a bug. Twice. The first report dates from April 2008 and seems to have first occurred in Firefox 1.0 (!). And no, it doesn’t look like there’s a fix in sight, either. 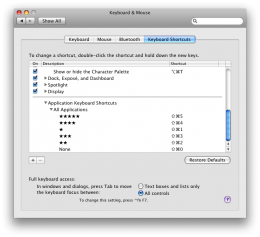 Posted in: Apple, Blog, Keyboard shortcuts, Mac OS.